Size: 3.1" x 5.2" x 0.5"
The PS-2460i Databank stores 150 names and numbers in a small housing with a protection lid. In addition you get an alarm clock and a useful calculator with metric-US conversion capabilities. The PS-2460i with the INDIGLO backlight feature is otherwise identical to the earlier PS-2400+. The display of the PS-2460i consists of one line for alphanumeric characters and one line supporting only numbers. The PS-3660i packaged in a similar housing sports a 3-line display and 8k RAM. 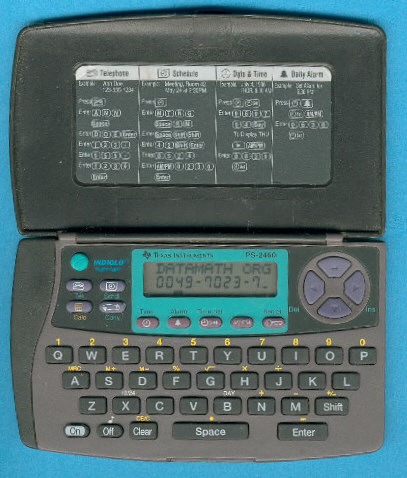 This Databank was replaced in the year 1998 with the PocketMate 100 sporting a three line display and separated number keys.